Build a village today, a capital tomorrow. 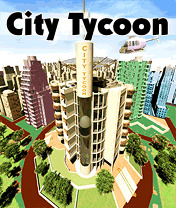 City Tycoon is unique and breathtaking city building strategy, never seen before on the mobile screen. A definitive "for gamers by gamers" game, fulfilling every player's dreams. Build your own city and ensure it's prosperity, while facing pollution, crime, fire hazard, disasters, unemployment, energy shortages and ever growing demands from the citizens of your city. Set the right tax levels and watch your budget closely for even the slightest movement of butterfly wings can ruin the economy of your empire.